Big Sky Resort, located in south central Montana (approximately fifty miles south of Bozeman), provides visitors with updated amenities, a well-developed infrastructure and over 5,850 acres of skiable terrain. Big Sky services its 4,350 feet of vertical via 24 chair lifts and 12 surface lifts. The ski area has a summit elevation of 11,166 feet and sees an average annual snowfall of more than 400 inches. This Montana resort offers more than stunning views; the resort has expansive expert and advanced terrain while including an extensive network of trails suited for the intermediate and beginner skier or snowboarder. The resort is the basecamp to Yellowstone National Park and provides daily shuttles to Yellowstone’s west entrance. The resort has everything one would expect from a modern ski resort including a variety of dining, lodging, and shopping possibilities. Big Sky offers 40 miles of mountain bike accessible trails during the summer, as well as golf, hiking, zipline tours and more. Big Sky is a destination resort that embodies a quiet remoteness but is also surprisingly accessible with 15 direct flights into Bozeman. Skiers and riders are rarely stopped by a lift line due to the resort's massive size and somewhat remote location. 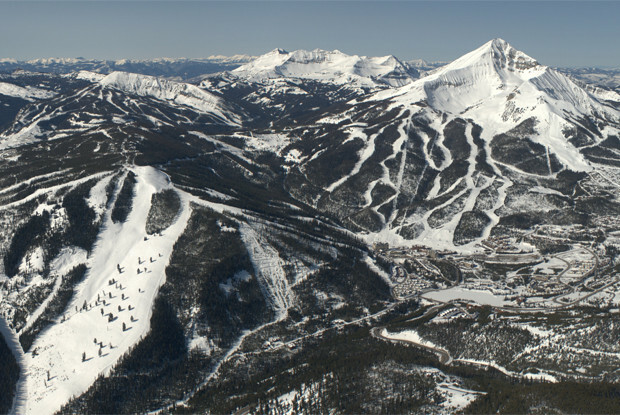 Big Sky Resort boasts an impressive vertical rise of 4,350 feet. The mountain’s summit of 11,166ft is serviced by the Lone Peak Tram that grants access to chutes and wide expansive bowls. From the top of the Lone Peak Tram, skiers and riders are able to see three states on a clear day including Wyoming and Idaho. The resort is located within the Madison Mountain Range and gets over four hundred inches of snowfall annually. Big Sky is home to runs up to six miles long, excellent tree glades and expansive bowls. The resort is mainly advanced and expert but beginners and intermediates also have multiple terrain options to explore. The Lone Peak Tram only carries fifteen passengers at a time so lift lines are guaranteed. When the wait time is too long check out the Challenger Lift that grants access to excellent terrain options similar to what one would find off of the Lone Peak Tram.